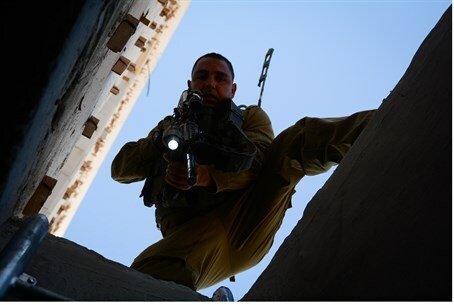 Army summarizes success in mission so far: 442 terrorists arrested, 1.2 million shekels in terror funds seized - and more. An IDF Spokesperson statement was released on Tuesday night, summarizing Operation Brother's Keeper which attempted to rescue the three kidnapped teens whose bodies were found Monday, and who were buried earlier on Tuesday. The statement reports that since the Operation began late on the night of June 12, when Hamas terrorists abducted the teens and, as was just discovered Monday, murdered them, the IDF along with security forces has cracked down on the terror organization. While noting IDF activities have not ended with the discovery of the bodies - and that forces are now focusing on capturing the two Hamas terrorists - behind the abduction, the statement records the arrest of 422 terror activists in the past 19 days. Of that number, 335 are listed as being affiliated with the terror organization Hamas, and 12 of them as leaders of the organization. A full 56 of those arrested were terrorists that were freed in the Gilad Shalit deal. It should be noted that one of the terrorists freed in that deal went on to murder Chief Superintendent Baruch Mizrahi Hy''d, as he was driving with his pregnant wife on the eve of Pesach (Passover). In addition, the IDF noted that 63 "Dawah", or outreach and recruitment institutions belonging to the Islamist terrorist group were targeted, including newspaper offices which functioned as a propaganda machine for the terrorist group to gain public support. IDF forces have also seized money which has funded 84 separate cases of terrorist activities, totaling 1.2 million shekels ($350,000), in a financial blow to the Hamas terror infrastructure. The IDF noted it had searched 2,218 houses and dozens of tunnels, caves and pits in the process of the search for the teens. In the process, the IDF also seized large quantities of weapons, which were transferred to the security services. 17 illegal buildings were also demolished in the mission. "The IDF strongly condemns the despicable crime that brought the death of the three youths and sends condolences to the Sha'ar, Frenkel and Yifrah families, and strengthens them in this difficult hour, an hour in which their sons are brought to their final rest," concluded the statement.